Many investors believe their portfolios have exposure to gold and precious metals because they hold stocks in mining companies. Bullion and mining stocks should be viewed as two different investments. But as a safe haven, no gold or silver or platinum mining stock (or even an ETF) compares with actual physical bullion. Let’s examine why physical bullion is the superior investment to mining stock’s for long-term investors. While mining stocks can provide attractive returns, they simply do not have the same risk-reward relationship or non-correlation to traditional financial assets as an investment in physical bullion. 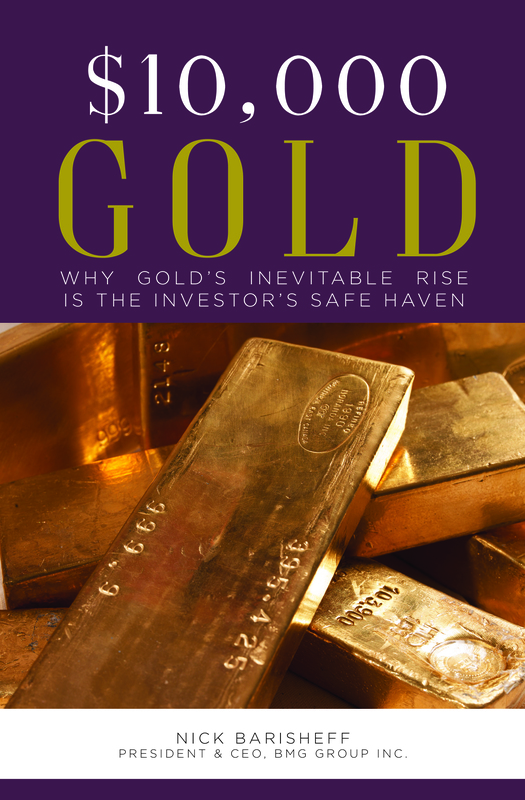 Physical bullion in allocated form is the lowest risk way to invest in precious metals. Unlike mining stocks, bullion is not subject to changes in production costs, management skills, availability of financing or exploration success. 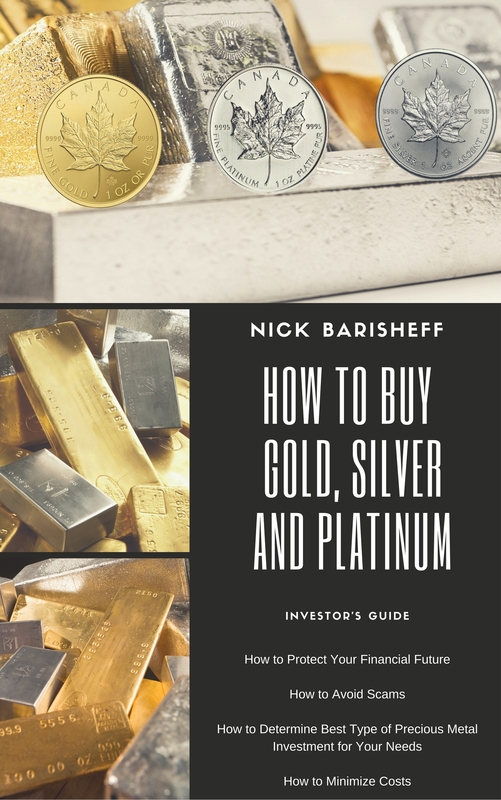 Allocated physical bullion provides the investor with unencumbered ownership because there is a huge difference between owning actual gold and owning a paper proxy such as an ETF or certificate. 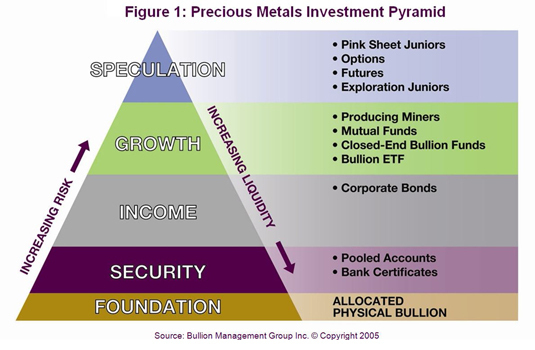 Fully allocated physical bullion should form the foundation of the investment pyramid (Figure 1) because it provides the lowest risk of all the precious metals options available to investors. It is also the most liquid investment no matter what the economic or financial conditions are prevalent. As confirmed by Ibbotson Associates, precious metals are the most negatively correlated asset class to traditional financial assets such as stocks and bonds. It is this key attribute that enables investors to reduce portfolio risk and obtain real diversification. Mining stocks and bullion are entirely different asset classes. During a rising trend mining stocks are often correlated to the metals; however, in a downturn such as we experienced in 2008 they can become more correlated to the broad equity markets. Because bullion is a safe haven during financial crises, it tends to outperform mining stocks during turbulent times – often quite dramatically. Of course, there are several categories of mining stocks, and each of these categories has a different risk/reward relationship and volatility profile. From a risk perspective, exploration juniors are at the top of the pyramid; further down are companies that have discovered reserves but are in feasibility analysis or in permitting; further down still are the producers. But since most mining companies do not pay dividends and have a depleting asset base, they are more suitable for short-term speculation than long-term wealth preservation or portfolio insurance. Again, without a physical bullion component, portfolios are neither balanced nor diversified. Mining stocks can be adversely affected by many internal and external factors beyond the underlying price of bullion. Variables include stock market volatility, geopolitics, environmental issues, management performance, business model, financial strength, mine life, productivity, efficiency, increases in operating and energy costs, and hedging policies. Even when the price of bullion is rising, mining stocks can fall because ultimately mining stocks depend on the performance of the management team. Bullion, on the other hand, does not rely on anyone’s promise of performance and cannot decline to zero, as the shares of many mining companies have in the past. Recently, spiraling production costs cut deeply into the margins of gold producers, in some cases making it unprofitable to mine at all. Because mining is such an energy intensive business, the volatile energy costs of the past year have made cash flow predictions difficult. When markets become volatile and stock prices decline, investors wishing to sell some of their positions may experience poor liquidity particularly in the junior companies. Allocated, segregated bullion, on the other hand, faces no such liquidity issues. The recent turnover of physical gold is over US$20 billion per day. The actual volume is estimated at 7-10 times that amount or about US$140 – $200 billion. This does not include gold futures trades on the commodities exchanges, or retail investment purchases, or jewellery. Total aboveground gold is estimated at US$4 trillion. In comparison, the total market capitalization of all global mining stocks is only about US$150 billion. Barrick Gold Corporation, the largest gold-producing company in the world, has a market capitalization of about US$34 billion, and it trades about US$600 million of its shares per day. This represents a turnover of about 2% of its market cap. Even if this turnover rate is applied to all mining stocks it would equate to a volume of about US$3 billion, or only a quarter of the gold bullion traded in London alone. In addition to higher liquidity due to higher market size and higher trading volume, gold bullion is accepted as payment globally, whereas a mining stock certificate would have little if any value in many parts of the world. Bullion offers superior performance during monetary uncertainty because global investors turn to physical bullion as a safe haven, rather than to shares of mining companies. This phenomenon was confirmed during the 1970s bull market for gold. 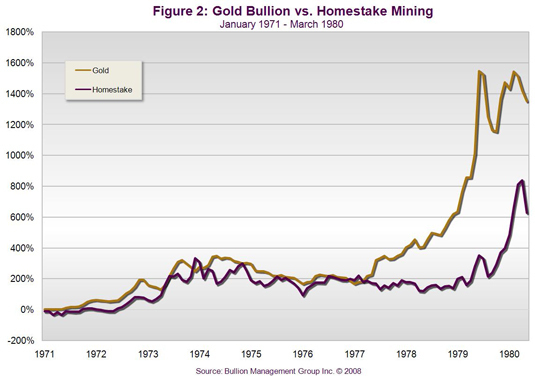 In Figure 2, you will notice that physical gold increased 15x (1,500%) during the 1970s. In contrast, the shares of Homestake Mining, the largest North American producer at that time, increased by only 8x (800%) during that same time period. While it is true that many junior mining companies outperformed Homestake in the 1970s, producing impressive returns for their shareholders, many others faded into obscurity, resulting in painful losses. The risk factors associated with junior mining companies versus bullion are simply not comparable. However, if you have a high risk tolerance and a good advisor, then a small allocation to junior mining companies may be appropriate. But mining stocks in general need to achieve significantly higher returns than bullion in order to adequately compensate investors for increased risk and volatility. While mining shares generally tend to track the price of bullion, they are still stocks. As such, they can become correlated to the broad equity markets. At the beginning of a bull market, it is well documented that mining shares typically rise, and often outperform bullion. However, when economic or market conditions deteriorate, global investors inevitably seek a safe haven for their wealth, as opposed to speculative investments. Thus, bullion eventually outperforms the shares. 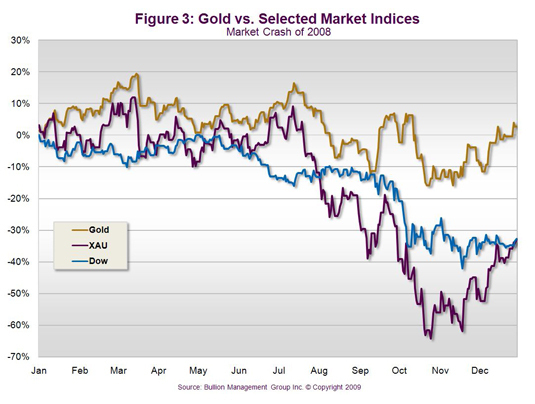 As you can see from Figure 3, gold maintained its strength throughout the turmoil of 2008, even as financial markets and mining stocks (as represented by the XAU Index in purple) were plummeting in value in the second half of 2008. 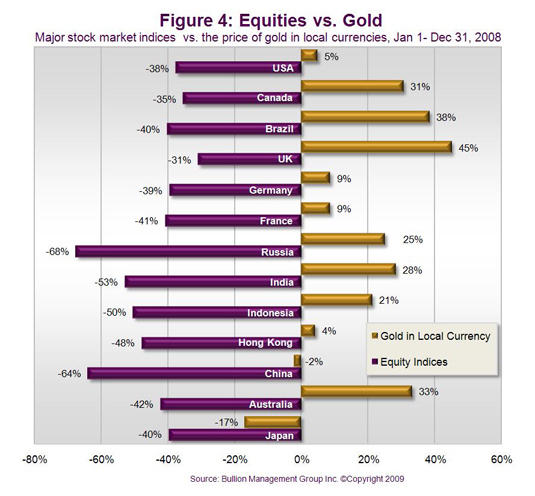 As Figure 4 shows, gold increased by 31% in Canadian dollars during 2008, while the TSX declined by 35%, the Dow by 34% and the S&P 500 by 38%. When the broad-based equity markets decline, they tend to impact all sectors, including the mining sector, regardless of the fundamentals. Because the commodity sectors are small in terms of market capitalization, any sell-off often can result in much higher declines. The Canadian mining stock mutual funds lost between 25% and 55% in 2008, whereas BMG BullionFund, a mutual fund that holds physical gold, silver and platinum bullion, lost only 4%. Choosing to invest in bullion or mining stocks is not an either/or decision. Depending on your risk profile and time horizon, a combination of stocks and bullion can provide an intriguing risk/reward balance for certain investors. In order to be fully diversified, investors need to include all the major asset classes in their portfolios: stocks, bonds, cash, real estate, commodities and precious metals. Of these asset classes, precious metals in bullion form are, over the long term, the most negatively correlated to traditional financial assets such as stocks and bonds. Holding bullion reduces portfolio volatility and improves returns during normal market conditions, and will act as portfolio insurance during periods of economic stress, growing in value and effectively offsetting losses in the other asset classes. During high inflation periods, bullion tends to outperform all other assets classes. During the 1970s, a memorable period of high inflation, precious metals outperformed all other assets classes for over 11 years. Many economists predict we will soon be heading into a period of inflation and possibly hyperinflation as a result of the ‘easy money’ policies implemented by deflation-phobic central banks. However, in order to fully protect portfolios from real inflation and market declines, a much higher allocation would be appropriate. Gold and silver have been used as money for over 3,000 years, and platinum for centuries. Today, the world’s wealthiest families still hold bullion to protect their wealth. Precious metals have proven to be the best protection an investor can have against both inflation and monetary crises. 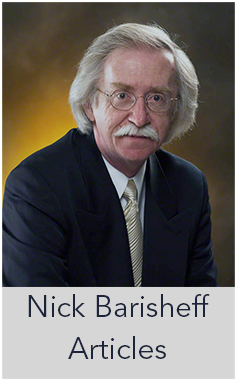 As the financial storm clouds intensify in 2009 and beyond, any portfolio without a sizeable physical bullion component is needlessly at risk.